Spaghetti Warehouse Columbus Day Special ~ $6 Meatball Meal! 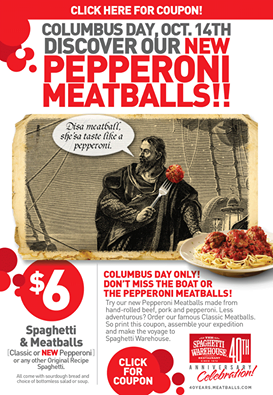 Discover the new Pepperoni Meatballs at Spaghetti Warehouse or just enjoy traditional Spaghetti and Meatballs on Columbus Day (10/14) for only $6! Print this COUPON and bring it with you to enjoy your $6 Spaghetti meal served with Sourdough Bread and and your choice of bottomless Salad or Soup. Previous postTexas Motor Speedway FREE Admission for Testing Days Oct. 14th – 16th! Next postLog Cabin Village Go Purple Friday ~ Half Price Admission Friday (10/11)!